So the Sun has turned on New Labour. The day after Gordon Brown's keynote speech at the Labour Party Conference 2009, Britain's top-selling daily led with the headline Labour's Lost It. Citing failures on law and order, education, health, immigration and foreign policy, the Sun formally anointed David Cameron as its preferred candidate in 2010. The Sun's decision has powerful symbolism. In 1992, it was credited with persuading voters to elect John Major's Conservatives over Neil Kinnock's Labour, prompting the infamous headline: "It's the Sun wot won it". 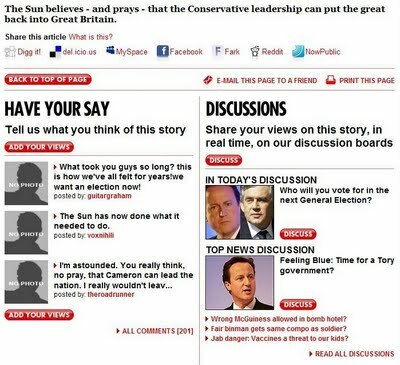 Then ahead of the 1997 general election, it switched sides with a front page entitled "The Sun backs Blair". Now in 2009, it has gone full circle. However, the prime minister has come out fighting. During a tempestuous interview with Sky News political editor Adam Boulton, Gordon Brown blasted: "People decide elections, not newspapers". This is very true. In the web 2.0 era, where people can instantly share their innermost thoughts, it may be even truer than Gordon Brown realises. Whether commenting, tweeting, posting videos or blogging, people have never had so much power at their fingertips. Twitter provides a seemingly inexhaustible supply of real-time views. 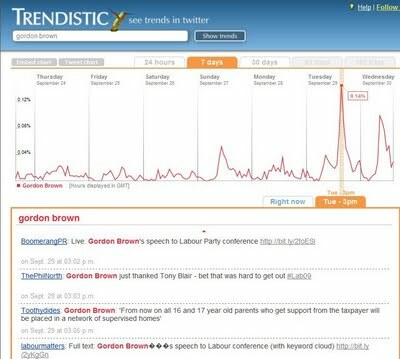 Indeed, a quick search on Trendistic shows that Gordon Brown was mentioned in 0.14 per cent of all tweets between 3pm and 4pm on the day of his speech. That may not sound like much, but it actually means thousands of people were blogging about the Labour leader in real time. And it's worth pointing out that 24 hours earlier, the tweet rate was just 0.01 per cent. Similarly, What the Trend? shows that 'Gordon Brown' and '#lab09' were both trending yesterday. Some tweets were positive, some negative and some even offered a real-time critique of key policies from his speech. Gordon Brown may not be committing to a televised debate, but glance at YouTube and you could be forgiven for thinking it is already underway. 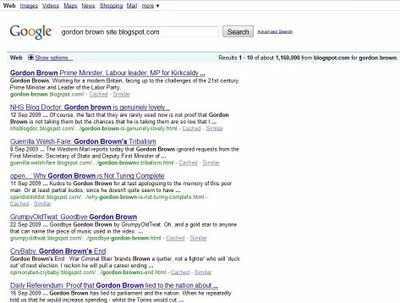 In addition to official coverage from the BBC and Sky News, a search for Gordon Brown also points you towards homemade conference analysis and satirical songs like the one below. And of course all videos can be commented on or rated at the click of a button. Gordon Brown is absolutely right when he says "people decide elections, not newspapers". But what he fails to grasp is that, thanks to web 2.0, everyone can now play political correspondent. Democracy has opened up politics to the masses. Barack Obama grasped this very early on, and indeed social media helped his presidential campaign. Gordon Brown, facing his own election battle in 2010, would do well to take note.